If the calendar is about to flip over to summer, it must be time for Apple to roll out another smartphone. Just as summer 2007 saw the release of the original iPhone and last summer brought us the iPhone 3G, this year, we’ve got a new model to obsess over—the iPhone 3G S.
And we won’t have long to wait before this new phone winds up in our hot little hands. 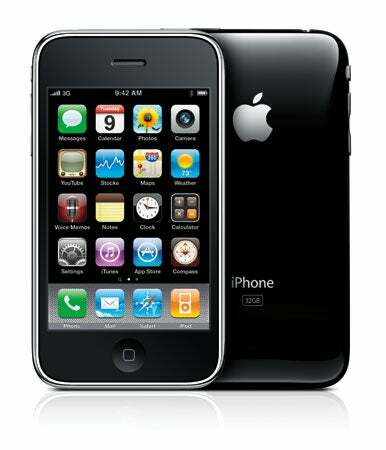 Apple announced the iPhone 3G S during Monday’s Worldwide Developers Conference keynote; it plans to release the iPhone 3G S next Friday, June 19. Can’t wait until then to find out all you can about the iPhone 3G S? We’ve perused Apple’s product pages, talked to company executives, and made some educated guesses about what you can expect from this latest addition to the iPhone family. How is this iPhone different from the iPhone 3G? Well, there’s an “S” in the name. You noticed that, right? Actually, as far as Apple is concerned, the S is more than just a humble naming convention. “The ‘S’ simply stands for speed,” Apple senior vice president for worldwide product market Phil Schiller told the WWDC keynote audience, and as far as the company is concerned, that’s the main selling point for the iPhone 3G S.
According to Apple, this is the fastest iPhone yet—up to two times faster and more responsive than the iPhone 3G. Specifically, Apple says that apps will launch faster and that it will take less time to jump between apps, say, by clicking a link in an e-mail to open a Web page in the mobile Safari browser. Speaking of browsing, Web pages should render faster on the iPhone 3G S, too. How much faster? During the keynote, Schiller quoted a few numbers—loading a game was 2.4 times faster on the iPhone 3G S than on the iPhone 3G. Viewing attachments was 3.6 times faster. Loading the NYTimes.com Web page was 2.9 times faster. And so on. Of course, we’ll have to wait until the new phone ships to verify these numbers or confirm if the improved performance is that noticeable. How did Apple boost performance? The company isn’t really saying—it tends to be rather tight-lipped when it comes to the iPhone’s innards. But we’re reasonably confident that the iPhone 3G S sports a faster processor than its predecessor and that its operating system has access to more RAM. There could be changes to the display circuitry, too, which would account for Apple’s claims that the iPhone 3G S offers a better gaming experience. According to T-Mobile in the Netherlands, which appears to have accidentally posted the specs for the iPhone 3G S, the latest version of the phone includes 256MB RAM, up from 128MB on the iPhone 3G, and a 600MHz processor. That would be an improvement from the 412MHz version found in the iPhone 3G. You said “a better gaming experience”—how so? The graphics should be more responsive. “A faster better, quicker, snappier experience,” is how senior director of worldwide iPhone product marketing Bob Borchers put it to us. For starters, Apple says the new iPhone supports Open GL ES 2.0, the latest 3-D graphics API for mobile devices. But the graphics hardware itself also appears to be significantly improved. The graphics processor is reportedly the Imagination Technologies PowerVR SGX, a powerful mobile chip that takes advantage of Open GL ES 2.0 to provide advanced shading and rendering capabilities. The result is an iPhone that, according to some developers, will rival dedicated gaming handhelds. OK, so what else is different? Just looking at the surface, not all that much. In fact, we’re wiling to bet that if we set an iPhone 3G S next to an iPhone 3G, you’d be hard-pressed to tell which is which—at least until you flipped the phones over. Then, you might notice that the “fine-print” writing on the back of the phone—you know, the part that lists the phone’s capacity and tells you that it’s designed in California and assembled in China—is now color-matched to the silver Apple logo. The screen is covered with a new oil-resistant, or oleophobic, coating, making it easier to wipe off fingerprints. We watched an Apple executive take an iPhone 3G S and wipe it off with his shirt sleeve, something that wasn’t too effective in removing smudges with earlier models. Then again, physical changes usually aren’t the focus of these iPhone updates. Apple puts its effort into upgrading the software features offered in new phones. What are the new features in the iPhone 3G S that aren’t in the iPhone 3G? 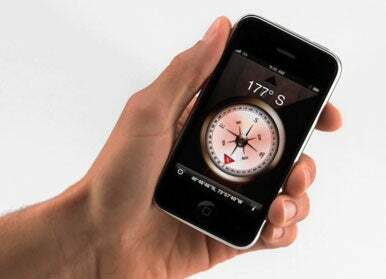 The iPhone 3G S features a compass app that knows which direction you’re facing. The iPhone 3G S has a few features that you won’t find in previous models. Just as the iPhone 3G added the ability to figure out your location via GPS (Global Positioning System) satellites, the iPhone 3G S lets you know which direction you’re pointing in via a built-in compass. The iPhone 3G could figure out which direction you were moving in by tracking you via GPS, but the iPhone 3G S will know your orientation even when you’re still. This is useful for maps and GPS applications (and Boy Scouts, presumably). Who knows what clever iPhone app developers will come up with to take advantage of knowing when your iPhone is spinning and when it’s still. In addition to a new built-in Compass app, compass features are integrated into the Maps app. In Maps, tap the current location button to display where you are on the map—that’s a feature you’d find with the original iPhone, the iPhone 3G, and even the iPod touch. But tap the location button again, and the map will re-orient itself to the direction you’re facing. Turn east, and Maps will rotate to that direction. It should make navigation much easier. This iPhone also supports voice control. You can now dial the phone by holding down the Home button for a couple of seconds and then commanding your iPhone to dial Joe Blow (or any other contact in the iPhone’s Contacts list). You can also speak a phone number instead of a name, and Voice Control will dial that, too. In addition, you can ask your iPhone 3G S to play music—specific songs or playlists, for example. Say “Play ‘Know Your Enemy,’” and the iPhone 3G S, after repeating your command back to you, will begin playing Green Day’s latest single. You ask the phone what song is playing, and it will tell you the title and artist; you can also invoke the phone’s Genius feature by saying “Play more songs like this,” to play songs similar to the one you’re currently listening to. Voice Control supports 21 languages. Apple has also included Nike+ functionality in the iPhone 3G S. This means that—as with the second-generation iPod touch—you don’t need to attach a Nike+ dock-connector dongle to your iPhone to use it with a Nike+ sensor in your running shoes; the receiver is built into the phone (and the Nike+ app is pre-installed). Those worried about security will be happy—perhaps even excited—to learn that the new iPhone also includes hardware-based encryption of all data on the iPhone. Combined with the new wipe-it-clean option of Find My iPhone and encrypted iPhone backups in iTunes, this means that unless you leave your iPhone unlocked without a password, your data is safe from all but the most skilled thieves. I’ve heard that the camera is better in the iPhone 3G S. Is that true? 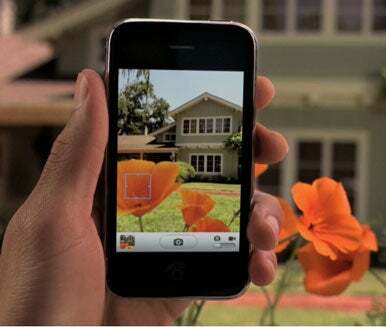 The tap to focus feature lets you decide which part of the image to focus on with the iPhone 3G S’s improved camera. Yes, the iPhone 3G S’s built-in camera is definitely better than what you found on previous iPhone models. It’s got three megapixels of resolution, up from two megapixels in previous models. And this camera has the ability to auto-focus. Apple also says that the quality of the images it takes are generally better than the previous model, including vibrant colors and better low-light performance, and that the camera can shoot much faster than the one on previous iPhones. If you’ve used the camera on the existing iPhones, you know that’s setting the bar pretty low. A cool new software feature in the Camera app is “tap to focus,” which lets you select what the camera focuses on. By default, the camera focuses on whatever object is in the center of the display, but if you’d like to focus elsewhere—say, an object in the background—just tap on the object on your iPhone’s display. The camera not only changes the focus but also adjusts the exposure and white balance, as well. The camera also includes an auto-macro mode, allowing you to get very close to the objects you’re shooting—a major failing of previous iPhone cameras. So can this iPhone finally shoot video? Yes, the iPhone 3G S’s camera can do one other thing you couldn’t do on an iPhone 3G or original iPhone—shoot movies. To be specific, that’s 30fps VGA video, which you can shoot in either portrait or widescreen orientation. You use the same Camera app, which on the iPhone 3G S features a simple Still/Movie switch. In Movie mode, you start recording by tapping on a red record button that’s in the exact same spot as the button that snaps still images; tap the button again to stop recording. Video is saved in the iPhone’s camera roll, alongside your photos. The video-recording mode provides the same auto-focus, -exposure, and -white balance features you get when shooting stills. And yes, when you shoot video you also capture audio through the iPhone’s microphone. Not only can you shoot video with the iPhone 3G S, you can trim start and stop points as well. Once you’ve shot your video, you have the option to trim the beginning and end of a clip by tapping on the video to summon on-screen controls and then dragging the start and stop points with your finger. Preview your edit by tapping Play; if you like what you see, tapping the trim button saves the changes. You can then share your clips with the world via e-mail, MMS (when AT&T supports it), a MobileMe Gallery, or direct upload to YouTube. How much does the iPhone 3G S cost? The answer to that question is not as straightforward as you might think. The price Apple touts for the 16GB iPhone 3G S is $199; a 32GB model costs $299. And if you don’t already have an iPhone—or you aren’t otherwise an AT&T customer using a subsidized phone—that’s the price you’ll pay. If you are a current iPhone owner, though, the situation gets a little trickier because of your service contract with AT&T. How far along you are in your two-year contract—and what model iPhone you use—will determine exactly how much upgrading to an iPhone 3G S will cost you. The basic rules in the U.S. appear to be: If you purchased the original iPhone, you’re immediately eligible for “new customer” pricing (otherwise known as Apple’s advertised $199 and $299 prices). If you purchased the iPhone 3G, AT&T subsidized the cost of that phone via the two-year contract you signed, so you don’t get the lowest price. However, if you purchased the iPhone 3G more than a year ago—and remember, it hasn’t quite been a year since the iPhone 3G’s debut—you should be eligible for AT&T’s “early upgrade” price on the 3G S: $299 and $399 for the 16GB and 32GB models, respectively. So if you bought the iPhone 3G on opening day (July 11, 2008), you’ll be able to buy the 3G S at a partial discount on July 11, 2009. (Note that this will require you to extend your AT&T contract until two years from the new purchase date.) If you purchased the iPhone 3G more recently, the prices are $399 and $499. Oh, and you’ll also have to pay an $18 “upgrade fee” regardless of which price you’re eligible for. That seems simple enough, right? Unfortunately, the real-world experiences of Macworld’s editors and readers indicate that the situation isn’t quite this straightforward. AT&T uses an internal formula based on numerous factors, including your tenure as a customer, your billing plan, and your bill-paying history, to determine which upgrade price you’re offered. We’ve seen all sorts of different prices when various members of our staff and their friends and relatives have punched in their phone numbers on Apple’s Web site. You won’t know what deal AT&T is offering you until you ask. Can you explain the pricing of this phone? I got a subsidized phone last year, but am not eligible now. Can I cross-upgrade and give my 3G to my wife? If I’ve got an original iPhone, do I have to pay the higher upgrade price? What are AT&T’s 3G S rate plans? And do I need to upgrade at the AT&T Store, the Apple Store, on the web, or somewhere else? Help! The pricing of the iPhone 3G S has engendered a lot of strong feelings, and understandably so. We will be devoting more coverage to this issue in the days ahead. The short version of the story is, when you buy a subsidized iPhone in the U.S., AT&T is actually paying part of the cost of that phone directly to Apple. AT&T gets that money back via your phone bill over the course of a two-year contract. If you want to get a new phone within the contract period, AT&T hasn’t had a chance to recoup its investment in your last phone, and things get complicated. We hope that AT&T will be working hard in the next week to better communicate what customers’ options are.